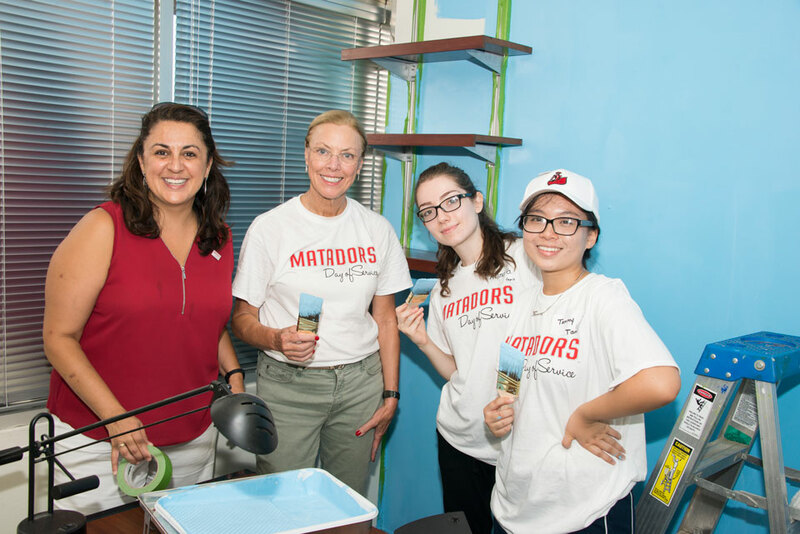 CSUN president Dianne Harrison helps to paint the room that will host the new CSUN pantry. Photo by David J. Hawkins. 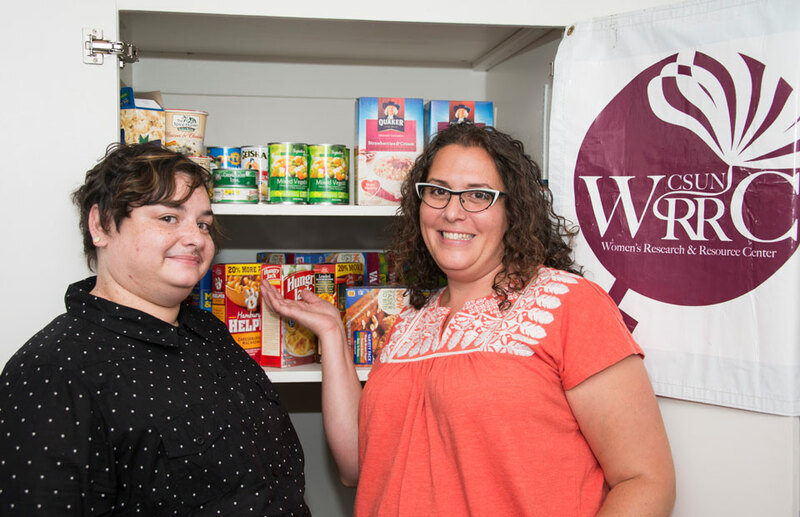 Orion Block (L) and Shira Brown (R) are the main organizers of the Women's Center"s food pantry. Photo by David J. Hawkins. According to a recent Los Angeles Times Article, about 10 percent of all California State University students are homeless and more than 20 percent are food insecure. To help students who suffer from food insecurity at California State University, Northridge, the Matador Involvement Center (MIC) as well as the Women’s Research and Resource Center have opened food pantries on campus this fall semester. “It’s important to support our students in any way that we can to get into that goal line of graduation,” said Maria Elizondo, the coordinator of the CSUN Food Pantry at the MIC, which will be temporarily located behind the CSUN Campus Store Annex, where the Tseng College used to be located. The entrance to the pantry will be on Lindley Ave and its hours of operation are 3 to 7 p.m. on Wednesdays and 11 a.m. to 3 p.m. on Thursdays. 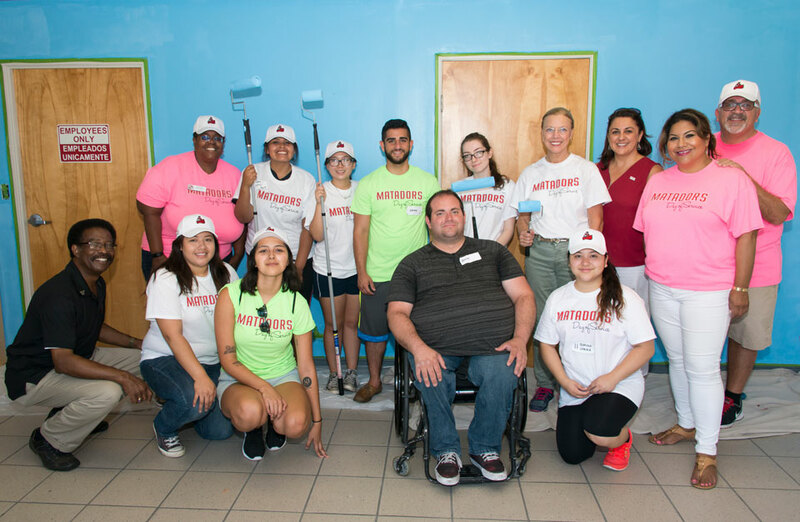 Volunteers of the Matador Day of Service, including CSUN President Dianne F. Harrison, have recently renovated and painted the pantry, which will be fully operational by the end of September. After fall semester, Elizondo said the pantry will move to its permanent location in Laurel Hall. Elizondo also coordinates CSUN’s Unified We Serve and will rely on volunteers of the program as well as a student assistant to manage the food pantry. Students won’t be required to show a proof of need in order to access the food, but a proof of campus affiliation, such as student ID. Shira Brown, director of the Women’s Center and Orion Block ’14 (Gender and Women’s Studies), who is also a graduate student in CSUN’s social work program, organized the Women’s Center’s food pantry — open from 8 a.m. to 5 p.m. Mondays-Thursdays and 9 a.m. to noon on Fridays. Brown explained that the pantry will support students who might not have enough to eat each day. Brown and Block had the initial idea of providing a food pantry to CSUN students about a year ago. After months of brainstorming about the possible implementation, they decided to clean out one of the center’s spaces to store food. Brown and Block reached out to CSUN housing and local grocery stores at the beginning of summer to ask for contributions and support. The San Fernando Valley Rescue Mission pledged to be a main donor and partner in fighting to end food insecurity for CSUN students. However, the pair also hopes that faculty and staff also will choose to support the food pantry through donations and outreach. “It also makes sense for us to partner up with faculty, because faculty are often the front line to know what’s going on in students’ lives — so they can refer their students,” Brown said. Block also hopes for support from fraternities and sororities that are regularly involved in philanthropic projects and have the potential to volunteer or coordinate food drives. The food pantry won’t be able to hold perishable foods such as fresh produce, but options like frozen vegetables would be a good way to accommodate healthier or more specific diets, Brown said. The organizers said they also hope to provide a variety of food that works with students’ living situations. Brown and Block hope to maintain the anonymity of students who pick up food at the pantry, but do have to track certain information to assess needs and plan for future evaluations. Even though the food pantry is hosted by the Women’s Research and Resource Center, which is sponsored by the Department of Gender and Women’s Studies, the food pantry is open to all CSUN students in need – not only the female population. For more information on how to donate or volunteer at the MIC pantry, visit http://www.csun.edu/mic or call (818) 677-5111. For more information on how to donate or volunteer at the Women’s Center’s food pantry, contact Shira Brown at shira.brown@csun.edu or call (818) 677-2780.